Get in the huddle with millions of other football fans - as the clock ticks down and the speculation heats up on who will be the major picks for the top football teams in this year's NFL draft. The 84th annual meeting of the NFL begins with live television coverage provided by ESPN and the NFL Network from Thursday, April 25 to Saturday, April 27, 2019. Coverage starts at 8 p.m. ET on April 25th for Round 1, resuming at 7 p.m. ET on Friday, April 26 for Rounds 2-3, and then again at noon on April 27. Nashville, TN, home to the Tennessee Titans, plays host to the NFL draft this year, marking the first time the event has been held in Music City. Jay Berwanger: "I'm outta here." 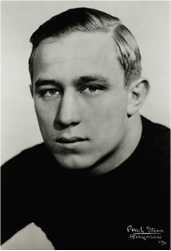 • University of Chicago’s Jay Berwanger was the very first Heisman Trophy winner. He also happened to be the first-ever No. 1 overall pick when the NFL implemented the draft in 1936. But the Eagles, who drafted him, couldn’t match his salary demands. The Chicago Bears also tried, and failed. Berwanger never signed with any NFL team and instead went to work for a Chicago rubber company. • Until free agency came into play in 1993, drafted players could forced to play for one team for their entire career -- as long as the team still wanted them. • Since 1976, the nickname for the last player selected in the NFL Draft has been "Mr. Irrelevant". The tradition began when the Steelers selected little known Dayton wide receiver Kelvin Kirk, who was given the moniker "Mr. Irrelevant" by NFL alumnus Paul Salata. The tradition continues today, when the last pick is whisked off to Newport Beach in Southern California and celebrated as the guest of honor during Irrelevant Week. • There might be something to the superstition that second quarterbacks picked in the draft suffer bad luck. Most recently they have included Johnny Manziel, Geno Smith, Robert Griffin III, Jake Locker and Tim Tebow. NFL.com - 2019 NFL Draft - Check out the official site with all the latest updates, feature stories, predictions, rumors and analysis, rookie stats & profiles, a complete link list of team draft sites, and extensive NFL draft history from 1982-2014. NFL Draft - ESPN.com - Get expert opinion on who to keep your eye on, along with top 5 by position, top sophomores, freshmen and more. Draft Insider's Digest - Stay ahead of the curve with reports from the field on top NFL and NCAA picks from pro football scout Frank Coyle. The Huddle Report - Player profiles, combine notes, links to radio reports, a team needs index, the top free agents and lots more..